A convenient monthly topical application that kills and repels fleas, ticks, and mosquitoes. Kills all flea life stages and prevents reinfestations. Repels biting flies and kills lice. And because it works through contact, there’s no biting required. Kills fleas within 12 hours, and kills reinfesting fleas within 2 hours. It's specially formulated for dogs with imidacloprid, permethrin and pyriproxyfen for broad spectrum protection. 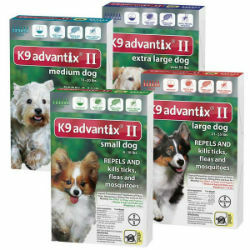 K9 Advantix® II is for use on dogs 7 weeks and older and weighing 4 lbs. or more. Options: Small Dog 4 – 10 lbs. Medium Dog – 11 – 20 lbs. Large Dog – 21 – 55 lbs. Extra Large Dog - Over 55 lbs.